Grandmaster of chess, Georgi Tringov (7 March 1937 – 2 July 2000), was a Grandmaster of chess from Plovdiv, Bulgaria. He won the Bulgarian national chess championship in 1963 - the year he was awarded the Grandmaster title, only the second Bulgarian player thus honored (after Milko Bobotsov). He was active mainly during the 1960s and 1970s and qualified for the 1964 Interzonal stage of the process for selecting a challenger for the World Chess Championship, but finished fifteenth in the Interzonal tournament and did not advance further. Tringov had numerous successes international tournaments to his credit, including first place at Vrsac 1973. Tringov placed fifth in the 1955 World Junior Championship. He played for Bulgaria in five World Student Team Championships (1957 through 1960), winning the individual gold in three consecutive competions: on board four in 1957 and 1958 and on board two in 1959 with a superb 92.3% score (+11=2−0). The Bulgarian student team was also successful those years, taking the team silver medal in 1957 and 1958 and the gold in 1959. 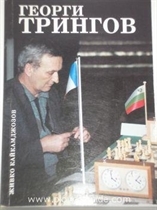 Tringov was a regular member of the Bulgarian team in the Chess Olympiads, playing in 12 Olympiads (every contest from 1956 to 1982 except 1960 and 1976). In 1978 he had his best Olympiad result, winning the individual gold medal on board three with a score of 77.3% (+11=3−0). Tringov earned the International Master (IM) title in 1962 and became a GM in 1963.